Watson also appeared in the ‘MSM’ yesterday to have a go at Labour general secretary Jennie Formby, claiming she had ‘staked her career’ on dealing with so-called Labour antisemitism and should be out of a job by Christmas if it’s not all done and dusted. What the two discussed is not yet known, but they arrived and left together so it was not a case of just brushing shoulders as they passed each other. It’s a free country and people can keep the company they wish. But if ‘sharing a platform’ with someone undesirable has become a thing, then Labour members will feel entitled to an opinion about the party’s deputy leader hanging out with one of the most viciously – if hilariously – anti-Corbyn dullards in the supposed ‘mainstream’, especially when he won election as deputy leader on a campaign promise to give loyal support to the successful leadership candidate. Mr Watson has been contacted for comment. I wish he’d join another party, instead of trying to destroy the one he’s in. Tom Watson cannot claim the moral high ground. Didn’t trust Watson from the start. Still don’t – but even more so ! Treacherous and devious man with highly elastic principles. An economic conservative at home, and a neocon abroad. Utterly untrustworthy. I thoroughly regret voting for him for deputy leader. So very sorry. There weren’t really any better options, though. I voted for Angela Eagle. With hindsight, and based on subsequent records, of the lot of them, I would probably vote for Stella Creasey. Her victory over the Tories on NI abortion funding was truly something she can be proud of as a successful attack on the Tories on an important issue. She is the only one I can recall ever turning her fire on the Tories at all. They were probably putting the finishing touches to whatever the RW are plotting for conference this year. Only someone with Watson’s brass neck would survive last years conference and losing McNicol and the office faithful. The delegates are expecting some stunts, and attempts to damage us. It won’t work. The Labour party, and movement, is bigger than that. 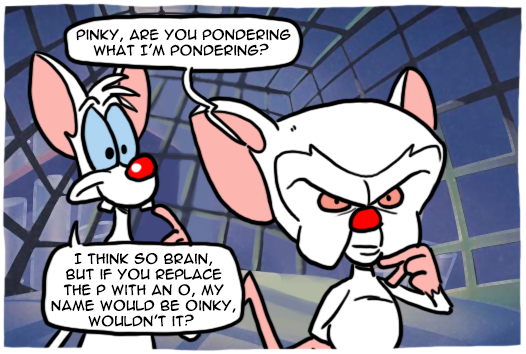 So, ‘Pinky’ met ‘The Brain’ in the strangers bar last night, did he? Dan Hodges is on of the most depressingly nasty people I’ve come across in my life. Id rather spend time with someone like Jacob Reece Mogg whose poliliitcs I don’t share, but at least he’s not nasty. I don’t know how anyone can bare to be around Hodges. It says alot about Watson if that’s the company he likes to keep. Of course he’s not, jess…I mean, Kate. What is Watson doing with the world’s foremost Corbyn hater? Obviously he is leaking defamatory information to him to write another scrurelous article attacking Corbyn. He is attacking Jenny Formby and is so pro Israel he is practically a Mossad agent. A devious treacherous man! Anyone who trusted the ‘Silent Bob’ of the Shadow Cabinet was always straying into Bandit Country. The most selfserving of politicians made sure he was already ahead of the game. Divided loyalties, moì? Dan Hodges is a disingenuous tory troll masquerading as a journalist. He is the son of Glenda Jackson former MP . She employed him in her office when and started him on his career. Nepotism is not unknown in the Labour Party-but what a poisonous snake was reared from this privilege. All these powerful socialist women MPs, Stella Creasey; Glenda Jackson; Angela Eagle……….spoilt for choice. Watson has until ‘let’s say’ Christmas to turn around Hodge’s outlook on Jeremy and the Labour Party. He’s staking his job on it and If he can’t do that we all should be calling for him to resign. Bob the Breton says hi to Avatar! I was previously quite attracted to the idea of having two deputy leaders, one man and one woman. A pity the notion was lost over time. He was on BBC4 Today programme talking about how he managed his weight. He’s obviously preparing for a career in the media which is usually where right wingers who have failed miserably usually go. GS had 6 years! Should have 2 deputies (one male, one female) and we need 2 Pro-JC candidates.